The Creeper (real name Jack Ryder) is a fictional character, a superhero created by Steve Ditko & Don Segall for DC Comics. He is portrayed as a former talk show host dressed in a wild costume with a green, yellow, and red color scheme. He is characterized by super strength, agility, and stamina; a healing factor enabling him to heal from virtually any wound; physically painful laughter; and proficiency in the martial arts. Most of his physical powers and abilities are the results of effects from serums and devices invented by scientist Dr. Vincent Yatz. The Creeper first appeared in Showcase #73 (March 1968). He later spun off into two brief series, one written by Dennis O'Neil in 1968 and another written by Len Kaminski in 1997 and 1998. In the interim, he was kept alive with sporadic appearances in solo runs and guest shots. His last comic appearance was in a six-issue miniseries written by Steve Niles in 2006. He also appeared in television shows like The New Batman Adventures and Batman: The Brave and the Bold, as well as the Batman Arkham video game series. Showcase #73 (April 1968), the Creeper's first appearance, with art and script by Steve Ditko & dialogue by Don Segall. The character first appeared in Showcase #73 (April 1968). 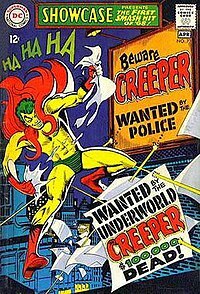 Following his debut in Showcase, the Creeper was given his own series Beware the Creeper, written by Dennis O'Neil; Steve Ditko plotted the first issue. It lasted six issues. Most pitted him against a chameleonic villain called Proteus, whose true identity was revealed just before his violent death in the final issue. The character's reappearance in Super-Team Family #2 in 1975/76 is unexplained, and his briefly-described origin does not match the one given initially. (Similarly, the 1990s series casts doubt on both The Creeper and Proteus’ origins.) Shortly after his last solo issue, the Creeper teamed with Batman in The Brave and the Bold #80 (November 1968), then guested in Justice League of America #70 (March 1969), where it was asked whether the Creeper was an outlaw. He also appeared with Batman in Detective Comics #418 (December 1971). After the origin was reprinted in Detective Comics #443 (November 1974), one of the "DC 100 Page Super Spectacular" series, the Creeper's alter ego Jack Ryder was shown working as a news anchor on Gotham City television in issue #445 (March 1975), and in Detective Comics #447–448 (May–June 1975) he became the Creeper again to help Batman escape a frame-up for murder. DC kept the character active with sporadic solo runs and guest shots over the next few years. He turned up almost immediately in issue #3 (October 1975) of the Joker's short-lived, self-titled series, in a story written by O'Neil, where the similarity in green hair and maniacal laughter caused confusion between the two. This was followed with a one-off solo story in 1st Issue Special #7 (Octoberb1975), penciled by Ditko. Other appearances in this period included team-ups with Wildcat in Super-Team Family #2 (January 1976), again written by O'Neil; with Batman in The Brave and the Bold #143 (October 1978) and #178 (September 1981); and with many fellow alumni (and a few non-graduates) of Showcase in that comic's 100th issue (May 1978). A story intended for the never-published Showcase #106 in 1978 (written and drawn by Ditko and which would be included in Cancelled Comic Cavalcade #2) was included in The Creeper by Steve Ditko hardcover collection published by DC in 2010. Among further solos were backup series in Adventure Comics #445–447 (1976), World's Finest Comics #249–55 (1978–1979, written and fully drawn by Ditko), and The Flash #318–323 (1983). Beginning in a team-up with Superman in DC Comics Presents #88 (Decemberb1985), written by Steve Englehart) during the Crisis on Infinite Earths company-wide story arc, the Creeper's depiction changed under different writers, which included a revised origin that was referenced but never wholly revealed. His deranged behavior, initially an act to frighten criminals, transformed into genuine, narcotics-induced psychotic behavior. In addition, Ryder could access his enhanced physical abilities only in his costumed form, and could no longer control his transformations. The new version came into focus when the Creeper teamed with the Justice League International in 1987. A decade later, DC gave the Creeper another chance in a solo comic, The Creeper. It lasted 12 issues (December 1997 – November 1998), including the 1998 DC One Million special numbering. Writer Len Kaminski focused on the breakdown of Ryder's sanity under the influence of the Creeper and made many references to previous continuity: the character is initially in an asylum and is formally diagnosed with bipolar disorder; his two personas frequently battle for control of their shared body. The Creeper starred in a six-issue mini-series, The Creeper volume 2 (October 2006 – March 2007), written by Steve Niles and drawn by Justiniano. Jack Ryder is a former Gotham City television talk show host who was fired due to his outspoken nature. In Bruce Wayne: The Road Home: Outsiders, it is revealed that he once dated Vicki Vale. Finding employment in security headed by Bill Brane, he attempts to rescue a scientist named Dr. Yatz whom mobsters headed by gangster Angel Devlin have kidnapped in order to obtain his newest discoveries. The chief mobster hosts a masquerade party at his mansion. To gain entry, Ryder improvises a costume from yellow tights and facial make-up designed to look like skin, a green wig and trunks, and red gloves, boots, and furry cloak. Ryder locates Yatz inside, but the mobsters discover him and first shoot at him, but then finally stabs him, wounding Ryder. Yatz injects Ryder with a serum and implants a device in his wound. The serum confers the power to almost instantly heal any wound and grants Ryder enhanced strength and agility. The device, used with its activator, causes the costume to disappear, leaving Ryder naked (he can later change into his formal clothes on command). Yatz inadvertently leaves the activator out of the wound, but does not realize this until after the wound had healed. At this point, the mobsters find their victims again, this time killing Yatz. Ryder discovers that with the activator, he can regain the wild costume whenever he wishes. With it, a crazy laugh and his enhanced physical abilities, he has no trouble routing the crooks. As the Creeper, Ryder has a series of adventures dealing with supervillains, while hiding his secret identity from his friends and cohorts and dealing with weather girl personality Vera Sweet who also acts as his love interest. The eventual revision of the Creeper's origin eliminated the serum and claims that the scientist surgically implanted two devices (some accounts claim a single device with two effects) that enhance Ryder's physical abilities and can recreate an object whose "imprint" is stored in its circuitry. The scientist performs this surgery to save Ryder's life after criminals he was investigating attacked and drugged him. Because the scientist is unaware of the drugs in Ryder's system he inadvertently recorded their "imprint" at the same time he recorded the "imprint" of the costume, thus the device that recreates Ryder's costume when he becomes the Creeper also recreates the drugs in his system, explaining the Creeper's odd personality. These drugs so overwhelm Ryder's system that their effect becomes cumulative and the Creeper gradually becomes more irrational. When the Creeper changes back to Jack Ryder, the drugs disappear and with them, the psychosis. Eventually, Ryder comes to believe that he and the Creeper are two entirely different people instead of two roles played by the same man; he also holds this belief in his Creeper persona, which becomes increasingly disdainful of "Jack Ryder". The Creeper once regained his rationality while bound by Wonder Woman's magic lasso, but the implications of this have never been explored. The Creeper appeared in the Eclipso: The Darkness Within annuals in 1992, tricked into taking up one of Eclipso's dark crystals, putting him under Eclipso's control. He is later freed by Bruce Gordon, a longtime adversary of Eclipso. In the self-titled Eclipso comic book series, the Creeper, Gordon and his wife Mona make an initial foray into the South American territory that Eclipso has conquered. This leads to an Eclipso-possessed peasant throwing the Creeper (and himself) off a cliff. The peasant is mentally abandoned and both are left to plunge to their deaths. The intervention of a stunt squad saves the lives of both men. Several other heroes join in the fight against Eclipso, including Major Victory, the original Steel, Amanda Waller, and Wildcat II. They form a team called the Shadow Fighters. In issue #13 of Eclipso, a portion of the Fighters, including the Creeper, make another trip into Eclipso's territory. Several hyenas, possessed by Eclipso, track down the Creeper and tear him to shreds. Most of the infiltration team is slain; only small parts of the Creeper are actually recovered. The remains, along with the other dead heroes, are stolen out from under Eclipso's control by surviving Shadow Fighters. Despite this death, a Creeper series was launched in 1997. There are indications in this comic that the Dr. Yatz origin as detailed in previous appearances is somehow false and that the Creeper's actual origins are in some way related to his longtime villain, Proteus. Before this was fully explored, however, the series ceased publication. In 2006, a new version of the Creeper appears in the Brave New World one shot, published following the events of Infinite Crisis. In the one shot, Jack Ryder is now the host of a controversial TV show, You Are Wrong!, promising $1,000,000 to the person who catches the Creeper. Following this, a six-issue Creeper miniseries revealed the new origin, seemingly taking place during Batman's early years. Ryder is said to support Dr. Vincent Yatz, who has been combining stem cell therapy and medical nanotechnology to create a revolutionary "nanocell" therapy called "smart-skin", which would enhance the body's regeneration to the point of giving new skin to burn victims and those who have suffered severe scarring. Ryder visits Yatz's lab just as the scientist is being threatened by mobsters attempting to steal the latest test batch of his newly discovered technology. Unable to escape, Yatz injects the last sample of smart-skin, still somewhat unstable, into Ryder's body in an attempt to keep it safe from the mobsters. When the criminals shoot Ryder in his head, the smart-skin activates, resurrecting Ryder moments later as the Creeper, a yellow-skinned man with superhuman physicality, green hair, and a mane of red hair growing on his back (as opposed to wearing fake red fur, like previous incarnations). The Creeper is a separate personality from Ryder and dispatches the criminals. Ryder discovers he and the Creeper can trade places, after which each acts as a witness to the other's activities and can mentally communicate with their alter ego. Initially wanting nothing to do with the Creeper, Ryder lets him out when the yellow-skinned creature convinces him to seek revenge on their would-be killers. During their pursuit of the criminals, the Creeper and Ryder learn that Yatz has secretly intended the smart-skin to be a weapon. Side effects of its use on human subjects seem to be a loss of mental control, along with the test subjects all getting yellow skin and a mixture of red and green hair. Yatz credits these side effects on the mind and body as resulting from a nerve agent (provided by his silent partner) he had added to the nanocells. This partner is revealed to be the Joker, who had hoped to combine his Joker venom (which causes temporary madness and usually death by laughter) and Yatz's technology to create an army of maniacal, superstrong, near-immortal soldiers. Batman and Ryder defeat the Joker, who later attacks Yatz in revenge. Batman discovers Ryder's double identity and creates a chemical agent that can cure him of the Creeper, but Ryder refuses and forms a truce with his alter ego, agreeing to let the Creeper out from time to time to fight criminals while hiding his identity from everyone including news rival and love interest Vera Sweet. In Countdown to Mystery #2, Jack Ryder is approached by Eclipso, who hopes to seduce him as she did Plastic Man. She succeeds, but the Creeper is later freed from the corruption by Bruce Gordon. In Green Lantern #24 (2007), the Creeper is seen, along with other heroes, fighting members of the Sinestro Corps in the streets of New York. During the Reign in Hell miniseries, the Creeper was presented as a demon that co-inhabited the body of Jack Ryder rather than an identity he assumed due to scientific experimentation. The story shows the Creeper demon separating from Jack Ryder, having been recalled to Hell by Lilith, the mother of all Earthborn atrocities. It is later revealed that the Creeper demon is just one of a similar-looking species of demon. The Reign in Hell miniseries had many internal continuity errors that made its place in DC Comics canon questionable and the idea that the Creeper was a demonic entity was not repeated afterward. The Creeper has joined the Outsiders. Later, the Creeper is one of the many heroes recruited to keep the villain Hush from exploiting his resemblance to Bruce Wayne. The Creeper is disguised as a high-level employee of WayneCorp, an excuse for him to accompany "Wayne". In The New 52, a 2011 reboot of the DC Comics universe continuity, the Creeper's origin was explained in Justice League Dark #23.1 which was retitled Creeper #1 as part of the "Forever Evil" event. In that issue, it is revealed that the Creeper originated as an oni in feudal Japan who "justifies cruel temper tantrums under the guise of spreading chaos." The Creeper first appeared as a cameo appearance as one of Andre Brigg's candidates for a United Nations–sanctioned Justice League. However, the Creeper was not selected to join the group. Jack Ryder appeared in Phantom Stranger #7, where he had recently quit his job as a talk show host at Morgan Edge's network. After intervention from the Phantom Stranger, Ryder ends up being killed by a monster's attack on Metropolis. The Presence, in the form of a dog, notes that the Stranger did not lead a man to his death, but to his destiny and that Ryder's story is not yet over. In Katana #3 (June 2013), after Katana's sword is broken by Killer Croc, the spirit of the Creeper is released from the captivity of her sword. It revealed that Katana's sword was used to kill the Creeper. In the following issue, the Creeper is seen bonding to Jack Ryder's dead body. The Creeper notes that he had used Ryder's body previously, calling him "old friend". He later confronts Katana and then retreats. In the rebooted continuity of the 2017 initiative DC Rebirth, Jack Ryder appears to be back to his original pre-New 52 version from before. While investigating a series of murdered criminals down in Chicago, Ryder ends up transforming into the Creeper again and battling against a Deathstroke copycat; while running into the real Deathstroke at the same time. In Red Hood and the Outlaws he is a member recruited by Bizarro. In the Watchmen sequel Doomsday Clock, Creeper is shown to have been captured by Kobra's cult until he is "saved" by Black Adam. He and Black Adam later attack Israel. In the collected edition of Wednesday Comics (200 pages, DC Comics, June 2010, ISBN 1-4012-2747-3; Titan Books, July 2010, ISBN 1-84856-755-3), the Creeper is featured in the story Beware the Creeper – story by Keith Giffen with art by Eric Canete. A man in squallor disposes of a dead body, but is met with a surprise. The Creeper's powers are physical in nature and a result of Dr. Yatz's inventions. He displays virtually superhuman agility and stamina, combined with strength. This enables him to perform amazing feats of acrobatics and leaping. He also seems to be able to climb sheer walls with little or no difficulty. His strength is enough to enable him to throw grown men several feet or jump several feet in the air. His speed and reflexes have also been enhanced greatly. These combined abilities make the Creeper a formidable fighter, incorporating brawling techniques with his physical prowess. A signature move of his is jumping onto the backs of his opponents and throwing them off balance. The Creeper also possesses a superhuman healing factor, which enables him to heal from virtually any wound; gunshots and stab wounds healing within a matter of minutes. It even allowed him to return from death when his body regenerated after being torn apart by Eclipsed hyenas. Also, his laugh is depicted as being physically painful to the ears of his victims, causing a psychotic comatose state. According to the Reign in Hell miniseries, the Creeper form of Jack Ryder is actually a member of a unique demonic species who all share similar physical characteristics. This idea was dismissed by other writers and in the retcon origin by Steve Niles, the Creeper was the result of Yatz's experiments and had the same powers as his original incarnation, along with a laugh that seemed to disorient opponents. The 2003 series Beware the Creeper, which is set in 1920s Paris, features a female Creeper. In the 1996 miniseries Kingdom Come, The Creeper appears as an elderly metahuman who works for Batman's rogue faction of metahumans. In the 1998 miniseries JLA: The Nail, where the public has been convinced that metahumans are alien invaders thanks to a smear campaign masterminded by Lex Luthor and a part-Kryptonian Jimmy Olsen, the Creeper is imprisoned by Cadmus Labs, Lois Lane noting that she once saw him save a family from a psychotic gunman. In the year 85,271 depicted in the 1998 "DC One Million" storyline, on the planet IAI, an entity known as RYDR senses a disturbance that may unravel all that is and transforms into its other, the sum total of collective unreason, shamanic avatar and raw distillate of madness known as The Creeper. The trail leads to present day Jack Ryder, who was tired of being a superhero. Jack and The Creeper became separate parts of each other, actual living beings. After The Creeper side kept splitting into bizarre and dangerous alternate Creepers each representing a different part of The Creeper's personality, Jack realized that whether he liked it or not, the Creeper was a part of him. The future Creeper ingested all the alternate Creepers, but realizing the truth of the event, he returned them to the original Creeper and told him and Jack Ryder to remerge, and The Creeper was reborn. The future Creeper returns to IAI with the last remaining alternate Creeper, the one representing self-loathing, which he disposes of before transforming back into RYDR to catalogue the event. In the Tangent Comics universe, the Earth-9 version of the Creeper is a powerful warlock and member of occult organization known as the Black Circle. In one of the possible origin stories for the Earth-9 version of the Green Lantern, Creeper and the other members of the Black Circle task Zatanna to retrieve the mystical Green Lantern. Nightcreeper (Kurt "Jack" Ryder) of Amalgam Comics combines DC's Creeper with Marvel Comics' Nightcrawler. Nightcreeper's "in-universe" first appearance is JLA: The New Blood; his actual real world appearance was in JLX #1 (1996). He is a member of the JLX, an amalgamation of DC's Justice League of America and Marvel's X-Men. In the alternate timeline of the 2011 Flashpoint storyline, Jack Ryder is in news broadcasting. He sends a message that Wonder Woman leads the Amazons in conquering the United Kingdom, renaming it New Themyscira during the war. In the New 52 Batman Beyond series, Jack has retired the Creeper identity but still anchors on the News 52. He co-sponsors a criminal rehab program which includes Melanie Walker, who was formerly Ten of the Royal Flush Gang. His co-anchor, Adalyn Stern, becomes the new Scarecrow due to a traumatic childhood experience she had with Batman, leading Jack to resent Bruce and his past actions. The Creeper appeared several times in the DCAU. Jack Ryder appeared several times in The New Batman Adventures, in which he was voiced by Jeff Bennett and served as a recurring reporter throughout the series. In the episode "Beware the Creeper", he anchors a live TV special on Joker's career from Ace Chemicals, where the Joker douses Ryder with his laughing gas and then pushes Ryder into a vat of chemicals. The gas and the chemicals transform him into the Creeper. The Creeper then goes on a crusade against the Joker to avenge himself (he's the first person that the Joker ever describes as a 'lunatic'), while frequently being sidetracked by an infatuation with Harley Quinn and his own stream-of-consciousness rambling. Batman manages to use a skin patch to suppress the Creeper, and informs Ryder he can still salvage his career. After Batman and Robin leave, Ryder thinks the situation over and removes the patch. Ryder begins chuckling, which soon becomes the Creeper’s signature laughter. The Creeper made frequent non-speaking appearances in Justice League Unlimited as one of the sixty members of the extended Justice League international. The Creeper appears in Batman: The Brave and the Bold, voiced by Brian Bloom. In "Shadow of the Bat", Booster Gold states that he has to cancel an appearance on Jack Ryder's talk show due to an emergency meeting of the Justice League International. In Batman: Arkham Asylum, he can be heard reporting about the Arkham breakout with a banner beneath the headline reads "The Jack Ryder Show". In the same game, he is also an unlockable bio when the player scans a radio broadcasting Ryder's show. Ryder's bio also makes mention of the fact that he is the vigilante "Creeper". He later plays a bigger role in the sequel Batman: Arkham City. After the game begins, one of the early missions features Bruce Wayne rescuing Ryder from some thugs in Arkham City, Ryder revealing that he wound up in Arkham City after he began to investigate Hugo Strange's actions and motivations in creating Arkham City. He reveals information about Strange to Batman after he is saved. He is also on Deadshot's hit list and Batman must save him before he is killed. Additionally, an interview between Vicki Vale and Mayor Quincy Sharp can be heard that reveals vigilantes operating in Gotham, including the Huntress and the Creeper. In the end credits of Batman: Arkham Origins, he is featured as heard interviewing several well known figures of Gotham City about the events that transpired during Christmas Eve involving Batman, the 8 assassins that were hired to hunt him down, and other villains involved. This led to Quincy Sharp issuing a statement, blaming the problem on the incompetence of Blackgate Prison, as well as vowing to reopen Arkham Asylum to house the supervillains that now reside in Gotham. In Batman: Arkham Knight, a "Gotham's Most Wanted Mission" involves Batman rescuing Jack Ryder from Deacon Blackfire's cult. After the revelation of Batman really being Bruce Wayne, Jack apologized about all the things he said to Batman about Bruce Wayne and all the things he said to Bruce Wayne about Batman. He also mentions how he "wishes [he] had super powers", a reference to his Creeper alter ego. Jack Ryder appears in DC Universe Online, voiced by Leif Anders. His voice is in TV/Radio segments called "You Are Wrong" found throughout Gotham and Metropolis. When found, Ryder proceeds to tell the truth about certain characters and plots (such as outing Lex Luthor as a member of the Secret Society of Super Villains) presumably using his alter-ego Creeper to gather this information. Jack Ryder appears in Batman: The Telltale Series, voiced by Robert Clotworthy. While the game proceeds, Jack Ryder is seen reporting on news about the recent events of Gotham City involving Batman, Catwoman, the GCPD, and other things. The most talked news that Jack Ryder talked about is the allegations that Thomas Wayne was allied with Carmine Falcone where they and Mayor Hamilton Hill placed those who wouldn't surrender their land to Thomas Wayne in Arkham Asylum. In Episode 5, Jack Ryder is kidnapped by Two-Face if the player chose to stop Penguin in Episode 4. After Bruce stops the villain, Jack tells Bruce he plans to praise his actions on the news to help restore Wayne's reputation. Jack Ryder appears in Batman: The Enemy Within, a sequel to Batman: The Telltale Series, voiced again by Robert Clotworthy. In Episode 1, he reports on the lower crime rate and the explosion at Wayne Enterprises that killed Lucius Fox. In Episode 2, Jack Ryder reports on Riddler's death and the attacks that are caused by the Pact. The Creeper appears as a playable character in Lego DC Super-Villains. Hasbro released an action figure of The New Batman Adventures version of the character in the late 1990s. Mattel released an action figure of the comic book version in its DC Universe Classics line in January 2011. Mattel released an action figure of the Justice League Unlimited version in its DC Universe: Justice League Unlimited Fan Collection line in November 2011. The Creeper has appeared in a Justice League Unlimited comic book, in which Batman enlists his aid to unravel a plan to detonate a nuclear device in Gotham. ^ Abramowitz, Jack (April 2014). "1st Issue Special: It Was No Showcase (But It Was Never Meant to Be)". Back Issue!. Raleigh, North Carolina: TwoMorrows Publishing (71): 44. ^ Ditko, Steve (2010). The Creeper by Steve Ditko. DC Comics. ISBN 1-4012-2591-8. ^ Schedeen, Jesse (14 December 2014). "Justice League Dark #23.1: The Creeper Review". IGN.com. Retrieved December 14, 2014. ^ Doomsday Clock #7 (September 2018). DC Comics. ^ Kingdom Come #2. DC Comics. ^ JLA: The Nail #2. DC Comics. ^ Tangent Comics: Tales of the Green Lantern #1 (Sept 1998). DC Comics. ^ Batman Beyond Vol 7. #20-24. ^ "Must Watch: Batman: Arkham City Video Has 12 Minutes of Gameplay to Drool Over". GamesRadar.com. The Creeper at Don Markstein's Toonopedia. Archived from the original on August 27, 2015. This page was last edited on 14 April 2019, at 23:47 (UTC).